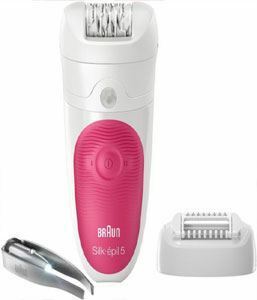 Developed for ease of use, comfort and great results, Braun Silk-epil 5 Wet & Dry removes even the shortest hair that wax can’t catch, leaving skin silky smooth for up to four weeks. Braun Silk-epil 5 Wet & Dry can be used in the bath or shower for a gentler epilation experience. Warm water has been proven to release endorphins, the body’s natural pain reliever, causing a pleasant feeling and significantly lowering any uncomfortable sensations during epilation. The epilator can also be used with shower gels and body washes for optimum gliding during use. When used regularly, epilation becomes virtually painless.